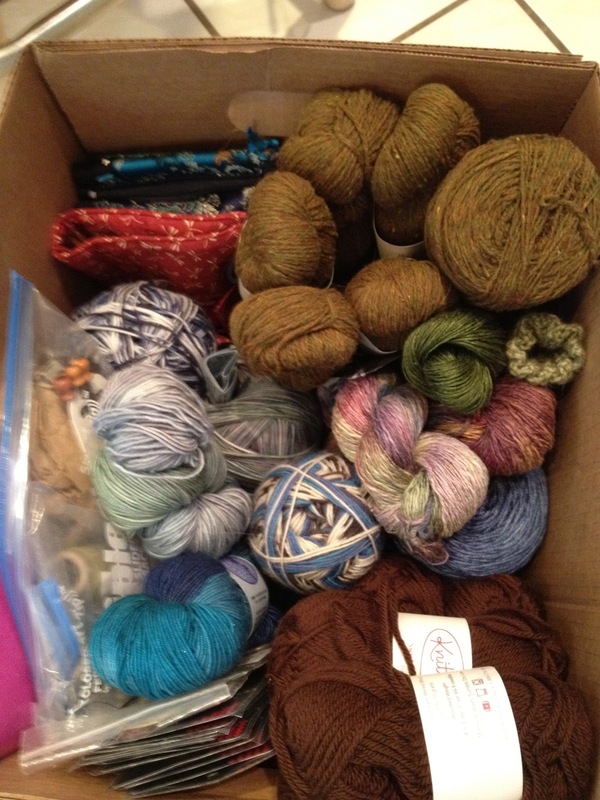 Hmmm….What knitting shall I work on? This was hard to decide–I need to set aside some knitting to work on over the next few weeks. I have to be strict with myself. The whole purpose of this exercise is to pull out the WIPs that I really want to finish, preferably before I cast on anything new. Sounds easy. If you are a knitter, you know it is never, never easy. So here are the WIPs (the only ones that I will admit to. The hidden message here is that there are more of them lurking around in the dark corners of my Yarn Sanctuary, aka extra bedroom, but we won’t talk about admit to them). Also-not in the picture because I am working on it now–my Sweet Georgia travel socks (April 2012) in Tundra. It would be nice to have all 8 9 of them done, but I will be happy if I finish 5 of them. But don’t ask me to designate which 5. And here is the box of new things that I will work on. Starting top R, 2 sets of Hiya Hiya interchangeables and my new KA Switch bamboo interchangeables,; 12 to 2 is Brooklyn Tweed’s Loft for my Cambridge Shawl (Churchmouse April 2012); just below is Louet Linen Sportwt for a beaded shawl and Araucania linen blend for a Dragon Spines beaded shawl (there are two skeins here, for 2 shawls); below is 2 skeins of Pashmina in Betty Draper’s Blues; bottom R Swish Worsted in Truffles for several Deer Hats; at 7:00 STR in My Blue Heaven for Karen’s socks; above that are 2 skeins of STR for a beaded Belle Nuit in the color way Rosemary Rocks(future bridal shower gift perhaps? ); above that is more sock yarn for Karen. 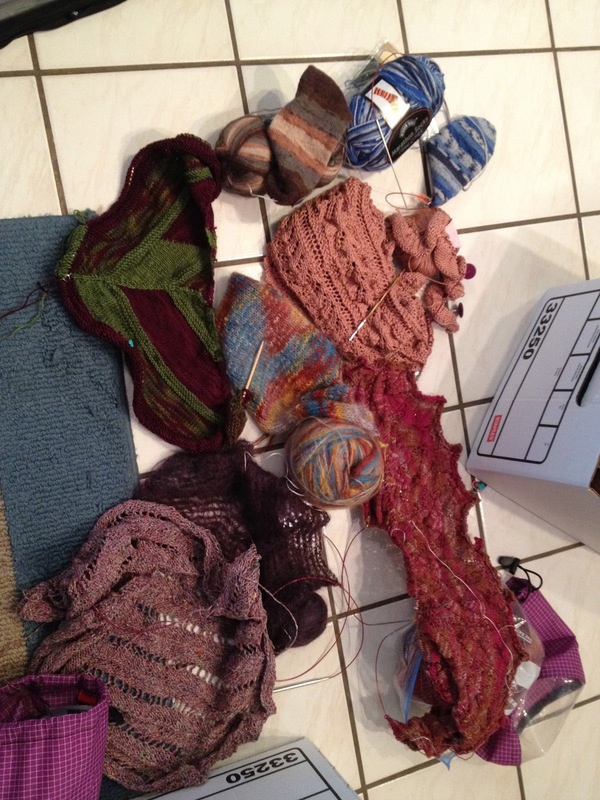 Somehow, my unfinished Kusha Kusha scarf sneaked over from the other box. Also poked in around the corners of this box are a liberal sprinkling of beads, some ChiaoGoo steel lace circa and a set of Addi Turbo Lace Clicks with the 5″ tips (fav!). One of the Dragon Spine scarves will get the first nod-it needs to be delivered early July. I know I am itching to dive into the Loft Cambridge shawl. It is fiddly to start but I hear that after a few inches it is an easily remembered repeat.